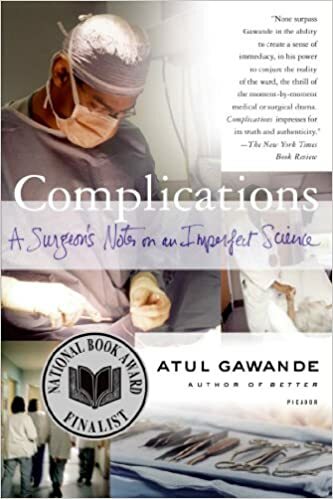 In Complications: A Surgeon's Notes On An Imperfect Science, Atul Gawande, a general surgeon at the Brigham and Women's Hospital, describes all the problems that surgeons in training and even professionals face in the emergency rooms. He argues throughout his book that there are always complications during surgeries and treatments of patients, but that those complications are what allows those practicing medicine to learn and fix their mistakes. Atul Gawande is a surgeon but I really liked that he admitted in this book that he as a surgeon and his practices are all imperfect. It might be hard to simply say these things because the public expects doctors and especially surgeons to be perfect beings. His message was very clear throughout the book: the world of medicine is constantly evolving and the only way to advance is to make mistakes. I think this book brings awareness to the public that doctors are not omniscient, and that the readers need to understand that doctors cannot promise anything. I would recommend this book to older teens because some of the anecdotes that Gawande shares may not appeal to younger readers. However, I think after reading this book, older readers will appreciate the world of medicine and all that we know in that field so far. Again, complications may seem like a negative thing in this this field of science but I think it's important for others to understand that they are necessary for the advancement of medicinal knowledge.